A High Energy Laser facility designed at the Atomic Weapons Establishment provides tools for advanced materials research. Engineers at AWE used LUSAS Analyst to help optimise the design of a laser mirror assembly used at the facility. Each computer controlled mirror assembly directs a 400mm x 400mm laser beam onto the target area. The mirror itself must remain flat and stable during use to achieve a pointing accuracy of 50�m at the target end of the 250m long beam path. To achieve this, each 425mm x 425mm x 10mm thick quartz mirror is bonded to a 70mm thick block of syntactic ceramic foam (Patent application number GB9701519.2) and attached to a mounting plate. Three height adjusters, fixed to the 70,000 tonne concrete structure of the laser facility, support the mounting plate via 3 flexi cross hinges which are mounted at optimum support positions. 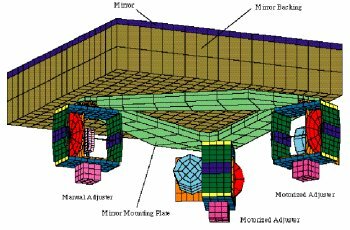 All components of the mirror assembly were modelled separately and attached together using a total of 84 sets of slidelines. Slidelines allow separate non-matching meshes to be used on contacting surfaces. 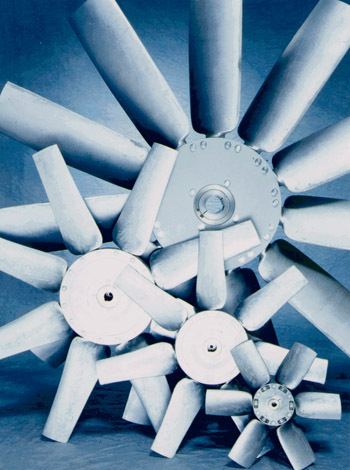 With slidelines, remodelling or moving of components without extensive remeshing is possible and interface conditions can be easily altered to suit design changes. 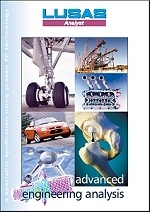 In all, 61 total model components of 10 different materials were defined resulting in a total model size of 4000 elements. The pitching modes of vibration were of primary concern in this analysis since these would affect the accuracy of the laser beam at the target the most. Heave, sway and torsional modes would have no effect on the target accuracy. The design aim for the lowest frequency mode was set at 10Hz. 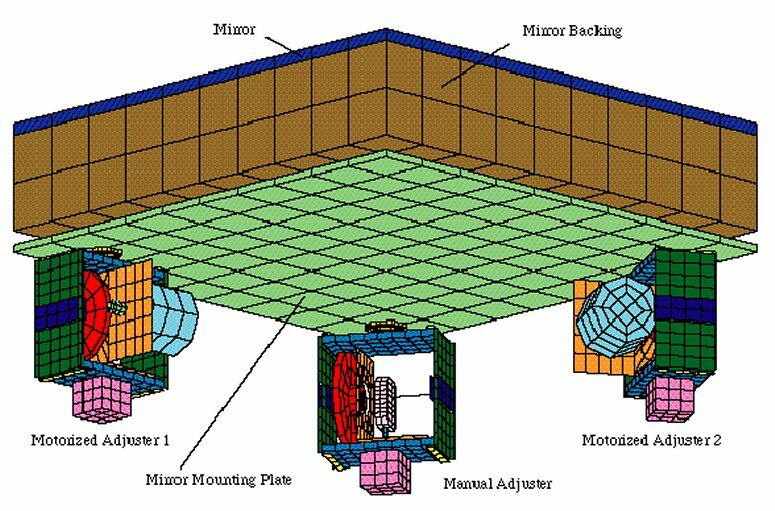 A series of analyses were carried out to investigate possible enhancements to an initial mirror assembly model. A natural frequency analysis of the initial mirror model found the lowest vibration mode to be a torsional one at 23.2Hz with the second mode being a pitching mode of 29.9 Hz. 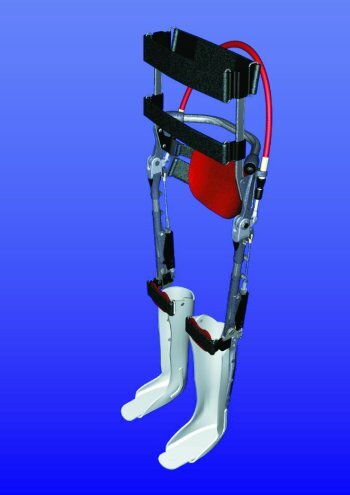 Investigations into adjusting the angle of the side plates, stiffening the mounting plate, and re-orientating the height adjusters resulted in raising the pitching and torsional modes. 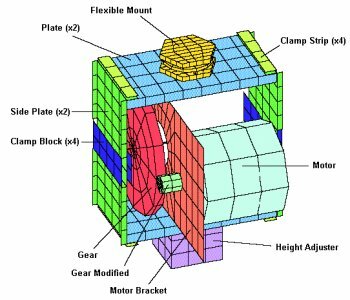 Based upon the initial findings the mirror mounting plate was then redesigned to increase stiffness and reduce mass. The height adjusters were also repositioned. As a result, a modal analysis of the modified design significantly increased the lowest natural frequency to 76.7Hz with no significant pitching modes occuring below 160Hz. With this model a loading analysis with the motorised height adjusters set to maximum adjustment of +/- 0.75mm and 1g vertical acceleration was carried out to investigate the effect on the mirror flatness. The target maximum design normal deflection was set by the laser engineers at 0.25�m. 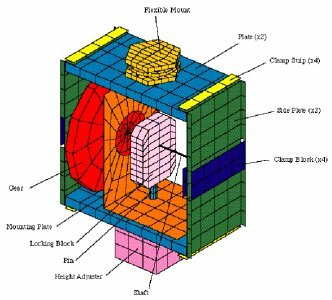 By investigating reducing the mounting plate thickness and mirror backing and flexi hinge properties a revised final mirror assembly design was achieved. The final design of the Mirror Assembly was found to have lowest pitching modes of 50.6Hz and 54.2Hz - well above the target minimum. The frequencies dropped from the optimum because of the reduction in Mounting Plate stiffness and the modifications to the flexi cross hinges. 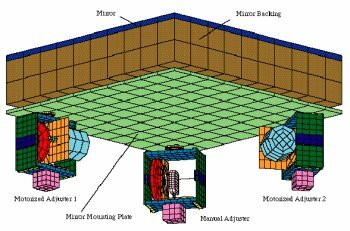 The final mirror assembly model was analysed to determine the response characteristics of the mirror surface when subjected to a ground excitation of 1E-10g/Hz over a range of 1 to 200Hz in all three orthogonal directions. The normal Power Spectral Density displacement response of the mirror surface was calculated for the surface nodes using LUSAS Graphics and the resulting deflections plotted. 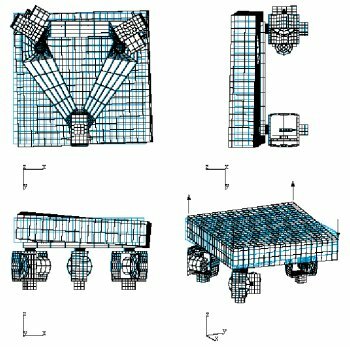 By using LUSAS Analyst the design of the surface flatness of the mirror was improved significantly by providing optimum adjuster assembly locations and orientations, increasing the overall stiffness, reducing the overall weight and decreasing the effect of adjustment. Estimates of expected deformation patterns and their magnitude have helped the laser engineers understand and improve their design. The models and techniques used in this analysis will provide AWE with a basis for further development of the laser mirror assemblies and to provide analysis guidelines for other similar equipment.